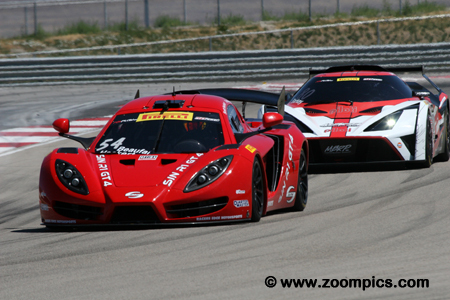 Utah Motorsports Campus hosted rounds fourteen and fifteen for the GTS cars in early August. Teams competed on the fifteen-turn 3.048-mile ‘Outer Course’. 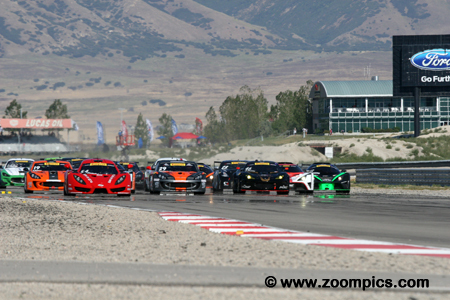 Sixteen GTS cars took the green flag for Saturday’s round fourteen of the 2016 Pirelli GTS Championship. As the cars pan out four wide into the first corner pole-sitter Scott Heckert racing the No. 54 SIN on ‘driver’s right’ leads the field. To his left is the Ginetta GT4 of fourth place qualifier Harry Gottsacker and third fastest qualifier Scott Dollahite in a Lotus. 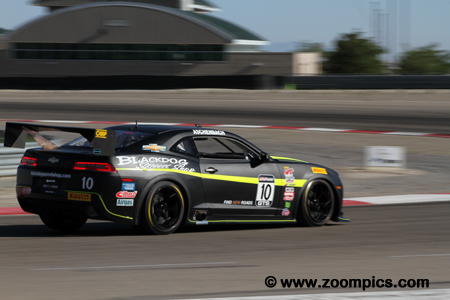 Anthony Mantella won his first Pirelli World Challenge event in round fourteen. 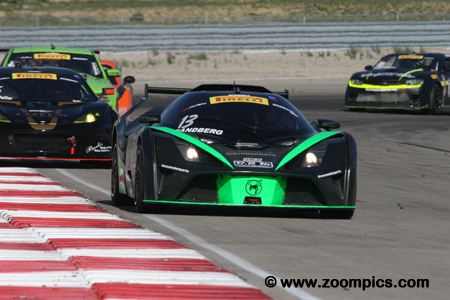 The Canadian importer for the KTM XBow GT4 qualified sixth but by lap-4 was in lead. Mantella lost first place to Harry Gottsacker but moved back out front to win by 2.285-seconds. In Sunday’s race, Mantella stalled on the starting line but recovered and finished eighth. 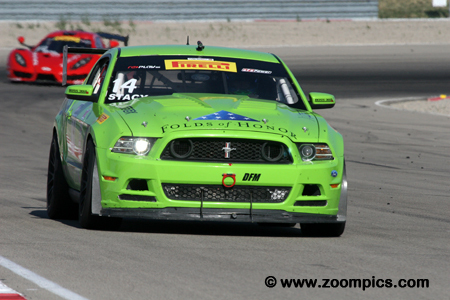 GTS points leader, Brett Sandberg, started from the fifth position in the weekend’s first event. Sandberg’s crew made some adjustments to the No. 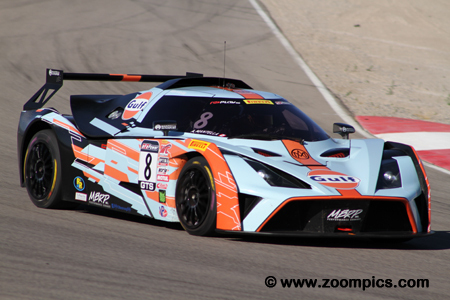 13 ANSA Motorsports KTM XBow GT4 after qualifying. The changes improved the car’s handling and he finished second. In round fifteen, he started second and finished third – more important – Sandberg increased his points lead over Lawson Aschenbach. 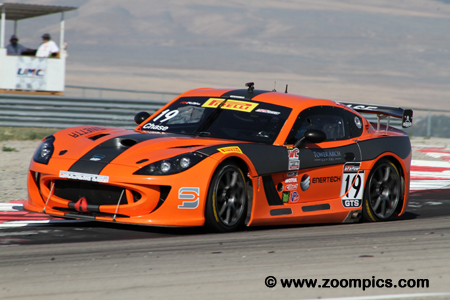 Fifteen-year-old Parker Chase qualified the Performance Motorsports Group Ginetta GT4 second in the weekend’s first event. Chase was challenged by Brett Sandberg and Scott Heckert during the race - he would finish third at the checkered flag. His fastest lap in Saturday’s event placed Chase fourth on the grid for round fifteen - he held this position for the duration of the race. The No. 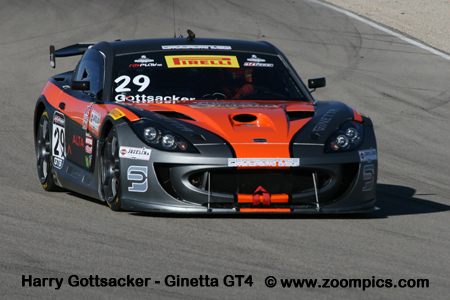 54 SIN R1 GT4 was entered by Racers Edge Motorsports for Scott Heckert. In Saturday’s race, Heckert started on the pole just 0.004-seconds quicker than Parker Chase. During the event, he dropped down the order and finished fourth. On Sunday Heckert fared much better. Starting from the fourth position he moved into the lead on lap-3 and won his first GTS race by 1.014-seconds. With the influx of GT4 prepared cars, it has been difficult for the traditional American marques (Ford and Chevrolet) to be competitive. Upholding their honour this weekend was Nate Stacy driving the Roush Performance Ford Mustang Boss 302. Stacy qualified ninth in round fourteen and finished twelfth after having issues with the differential. On Sunday, with repairs made, he rewarded the crew by earning the runner-up spot. It was a difficult weekend for multiple World Challenge class champion Lawson Aschenbach. In practice, Aschenbach driving the No. 10 Chevrolet Camaro was fifth quickest but in qualifying, he could only manage a tenth. During the first race, Aschenbach was rear-ended suffering some damage but finished seventh. In the final event of the weekend, he started eleventh and was seventh at the checkered flag. 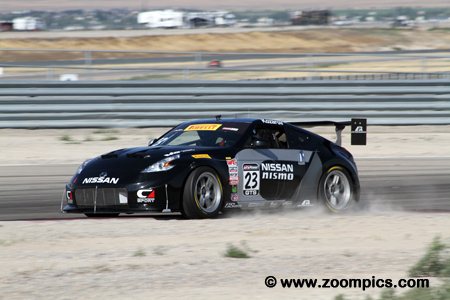 Local competitor, Vesko Kozarov, has proven to be a quick driver, especially at Utah Motorsports Campus. Kozarov was entered in the CA Sport Nissan 370Z but could only manage to go fast enough for the thirteenth grid position. He retired after seven laps and did not start the weekend’s final event.